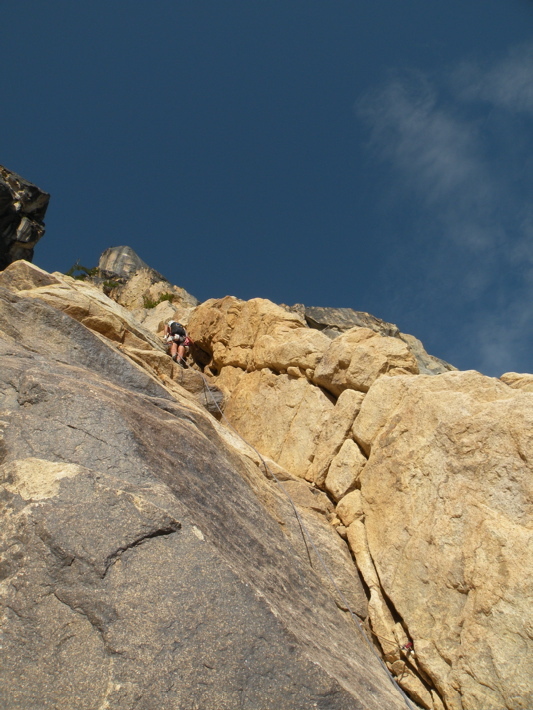 <-- To see all of the climbs I've done at WA Pass, go to my Climbing at WA Pass page. On the 10-hour drive back to Seattle from a climbing trip in the Valhallas (BC), my partner David and I were getting tired of sitting in the car, so we decided to stop to climb at Washington Pass off HWY 20. The East Face of Minuteman Tower was a great way to break up the drive! We enjoyed this route, but never found the "four aid placements" referred to in Beckey's description. 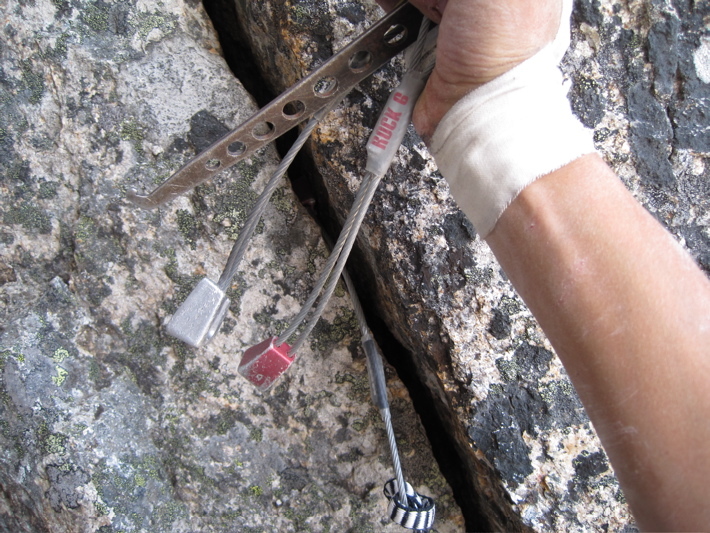 The 5.8 hand-crack on the shield near the top was one of the best! Minuteman Tower is on the east side of the Liberty Bell group at Washington Pass. It is dwarfed by its larger neighbors, but the tower's East Face is a great place to spend a day. 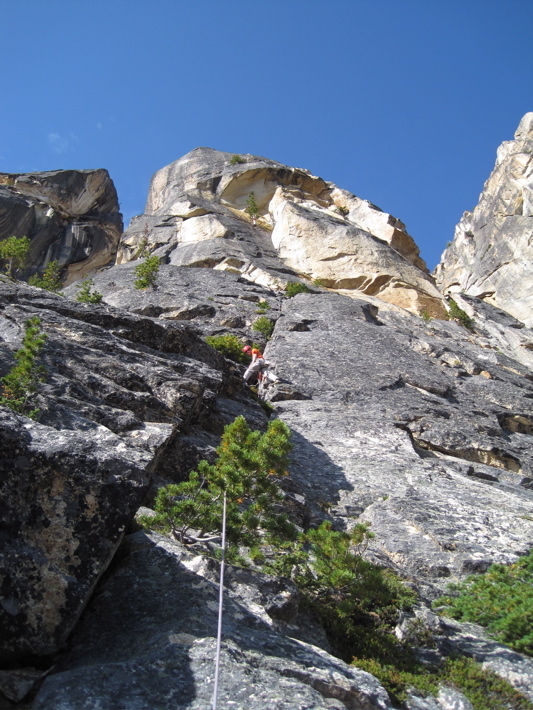 The whole route offers fun and challenging climbing, and the 5.8 handcrack on the upper shield is one of the best in the area. The approach is the same as for Liberty Crack. 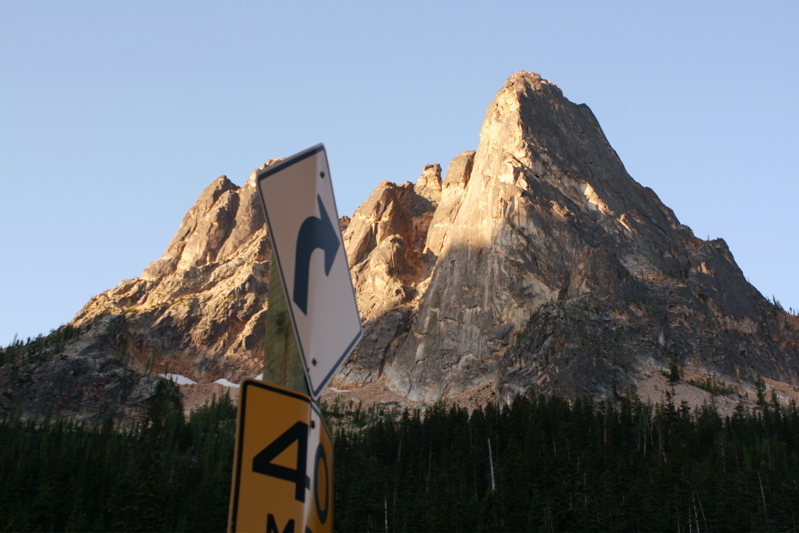 Drive SR 20 to a few hundred yards E of Washington Pass. There's a little pond next to the road; park near it and unload your stuff. Skirt the left side of the pond and head up the treaded path through the forest, bearing SSW until you break out into the talus field under the east face of Liberty Bell. Traverse under Liberty Bell and to the left side of the Minuteman near the base of the gully between Lexington Tower and MInuteman Tower. There might be snow at the base until late summer. About 1 hour to the base of the route. 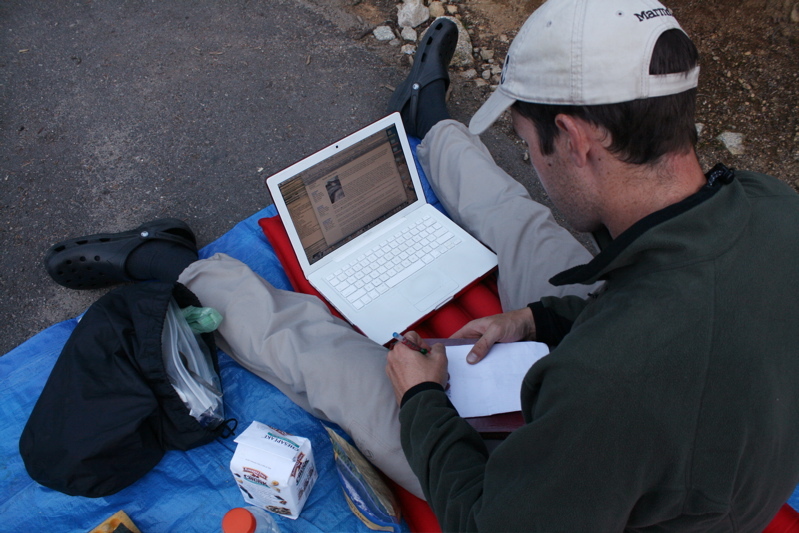 Getting ready for the climb Photo 1: The new age of route beta. 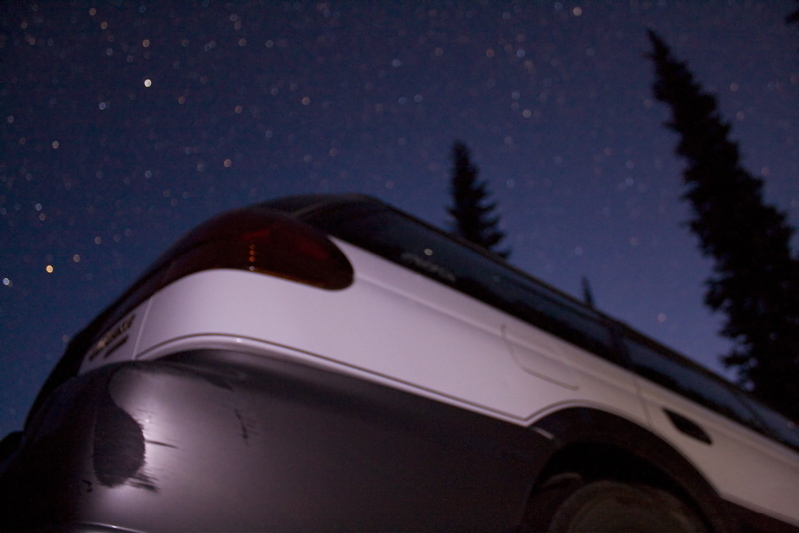 Photo 2: Night photography at our camp at the car. Pitch 1 Pitch 1: 5.7. Climb a corner up the left side of Minuteman. Photo: Steph leading up the fun corner. Pitch 2 Pitch 2: 5.8. Climb over a roof on a block and traverse to the right on thin face moves and then a roof into a crack system. Photo: David leading the initial roof move over the block. 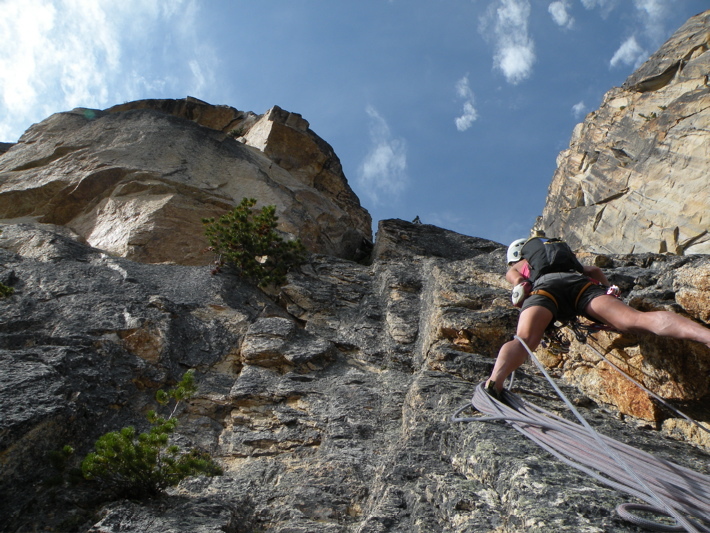 There are great holds and jams along the top of the block. Liberty Bell is in the background. Pitch 3 Pitch 3: 5.7. Continue up the crack system to top of the large apron, then traverse right below roofs to below the chimney or crack variation. 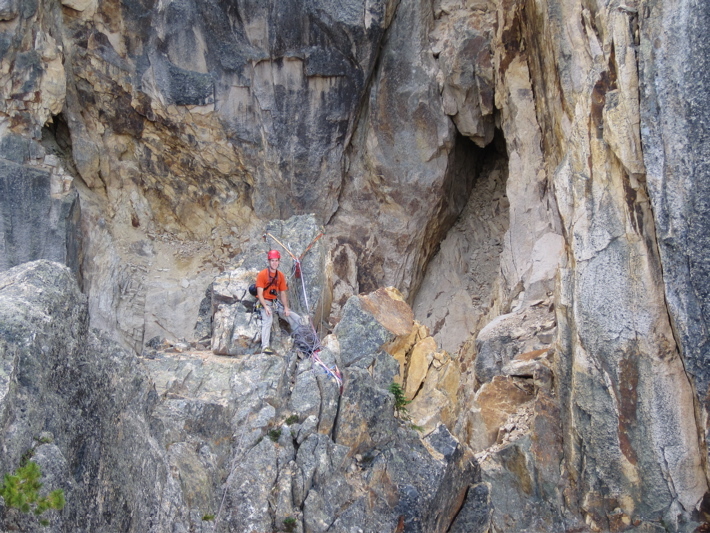 Photo: David at the belay at the top of Pitch 2. 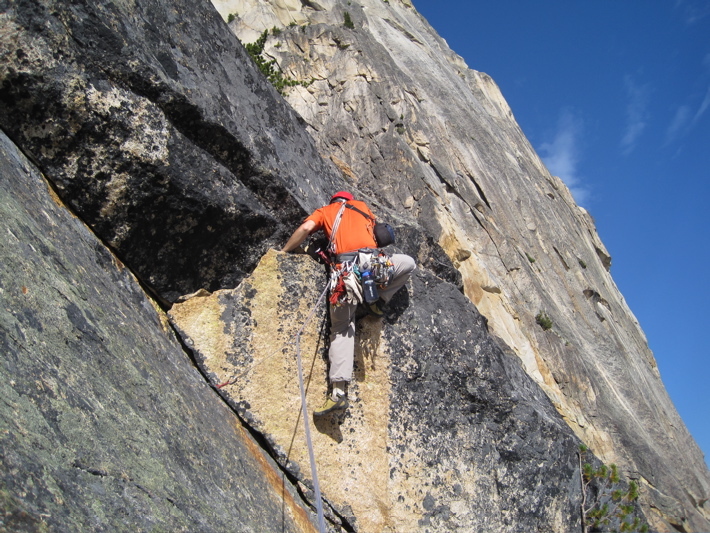 Pitch 3 climbs the crack above him, and traverses under the first roof (where the rock changes color in the photo) to the below the right corner of the summitblock in the photo. Pitch 4 Pitch 4 (chimney option): 5.8. Climb weathered rock up to the chimney, and climb over chockstones to a nice ledge belay where the chimney jogs left. Photo 1: Looking up Pitch 4. 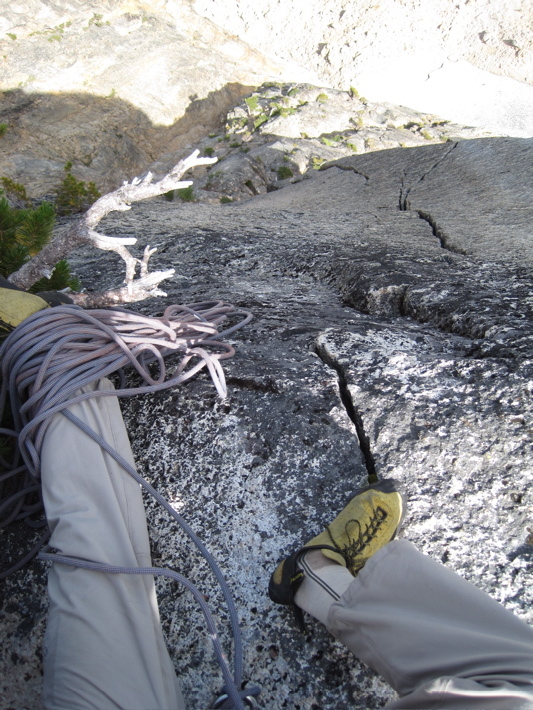 From the bush in left-center, the chimney is to the right, and the 5.10 crack is gained by traversing left. Photo 2: Despite the extra motivation of the 3 nuts I cleaned in the chimney, we found the chimney to have fun and good climbing (particularly the upper chimney). Pitch 4.5 NOTE: With a 50 or 60m rope, the second half of the chimney can be combined with either the first half of the chimney below, or the handcrack above. We chose to combine the upper chimney with the handcrack on the shield since the chimney jogs left halfway through at a nice belay spot. Pitch 4.5 (chimney option): 5.8. Continue up the second half of the chimney, and pull a fun roof/block move to gain the top of a pedestal. The top of the pedestal provides easy access to the handcrack on the shield. 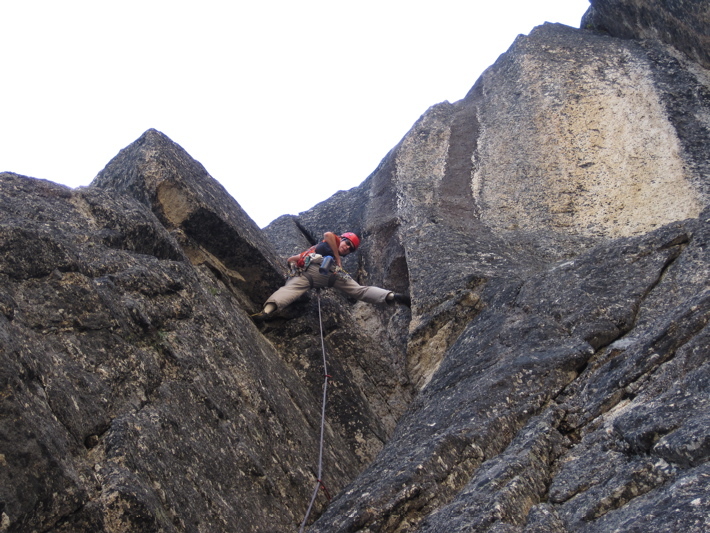 We combined this short upper chimney with the handcrack on the shield for what we agreed was the best pitch on the route. Photo: David climbing the upper chimney, which offered some great climbing, particularly the move pulling onto the pedestal just above him on the left. You can see the start of the handcrack of the upper shield above him. Pitch 5 Pitch 5: 5.9. Climb the stellar 5.8 handcrack on the upper shield, with a short crux 5.9 move near the top where the crack narrows to fingers. 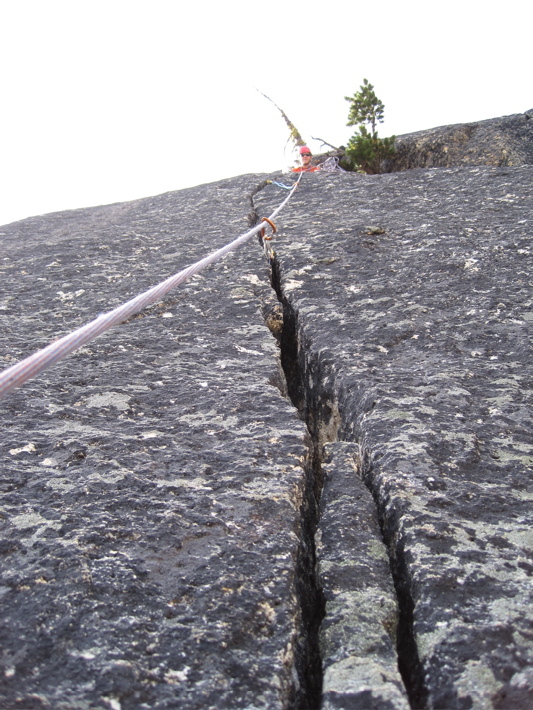 The handcrack is about 30m long, and can be combined with the upper chimney below without rope drag (as we did). Photo 1:Looking up the handcrack to the belay at the top. One of the best 5.8 handcracks in the area! Photo 2:Looking down the handcrack from the belay. The crack narrows to fingers for the final move, but this is a short 5.9 crux. Pitch 6 Pitch 6: 5.6. Climb/traverse easy cracks/ledges/blocks to the top of Minuteman Tower. Enjoy the rope drag. Photo: Steph near the top of Minuteman Tower. This photo was taken from the rappel anchor where Minuteman meets Concord Tower. Look closely - I appear twice in this photo! Descent Descent: There is a rappel anchor where the Minuteman meets Concord Tower. From here, rappel into the gully between Minuteman and Liberty Bell. There seem to be rap anchors on either the Minuteman or Liberty Bell side, every 30m or so on trees and horns. We rapped a route on the Minuteman side of the gully. Photo 1: David at the rappel anchor where the Minuteman meets Concord Tower. 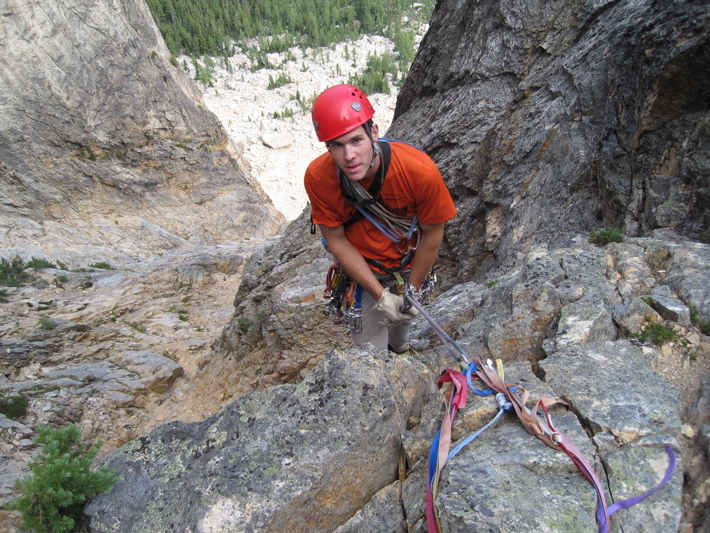 Photo 2: David beginning the rappel into the gully between Liberty Bell and Minuteman. There is a bit of downclimbing after the first rappel. Etc.... The climb up the East Face of Minuteman gives great views of Liberty Crack on the adjacent towering walls of Liberty Bell. 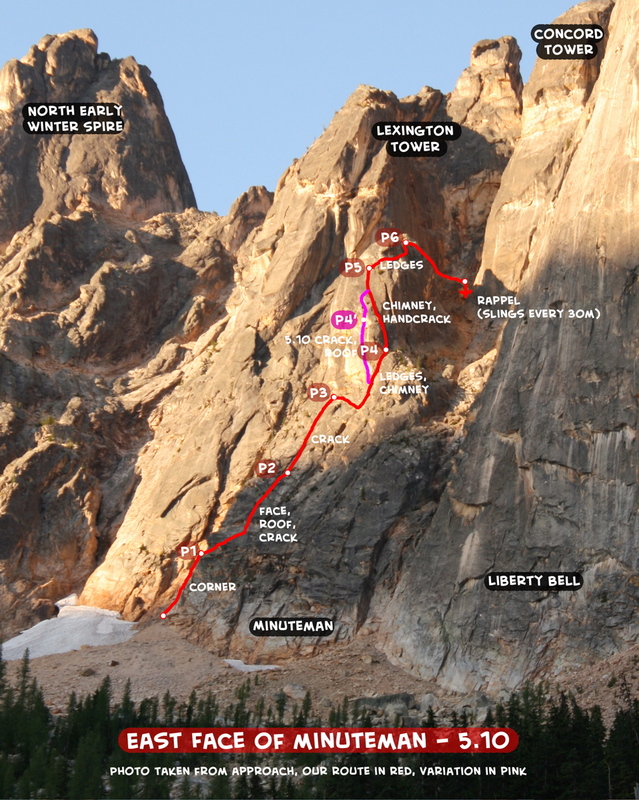 I enjoyed looking at Liberty Crack from this perspective, since I had climbed Liberty Crack in early August. Click here for my trip report for Liberty Crack. 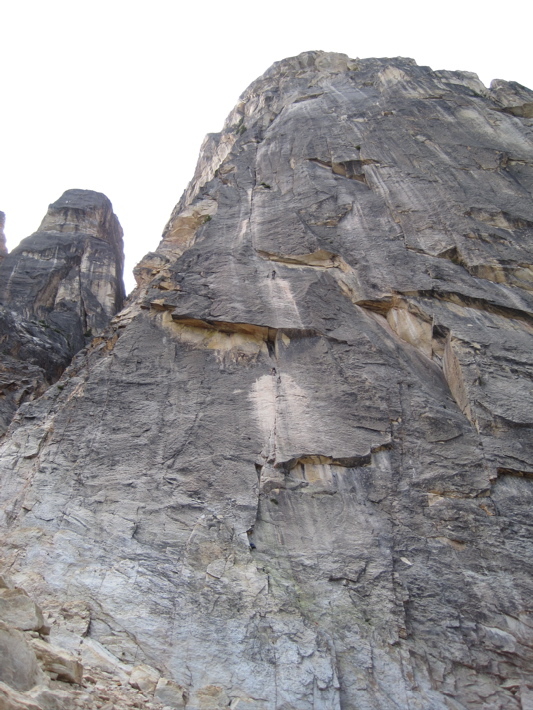 Photo: Climbers fixing the first 3 pitches of Liberty Crack. 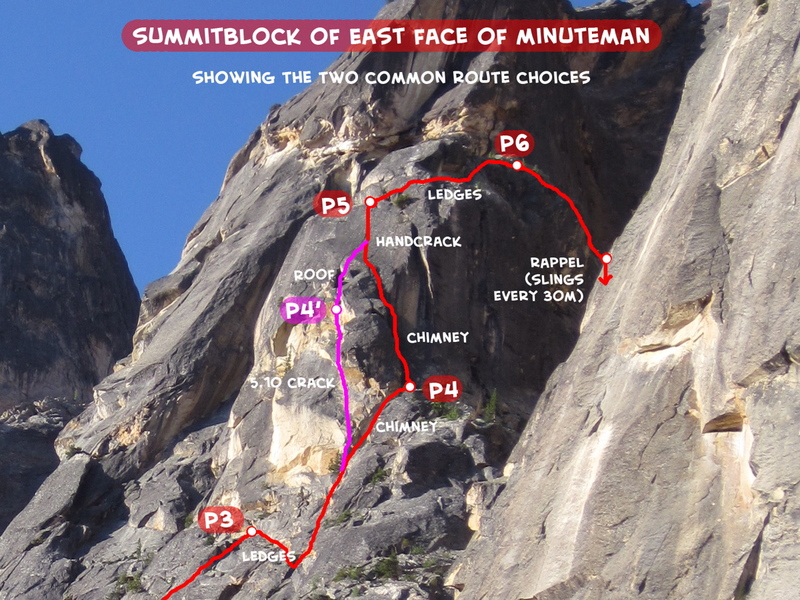 Lithuanian Lip (Pitch 2) is on either side of the climbers.